First, I’d like to say that I am not going to predict Arsenal drop out of the ‘Big 4’ this season. This is not to say I don’t think it will happen or that I would rather them remain in the much-coveted group; instead it is merely too early to make such a bold statement. Pre-season has barely started, let alone the actual season. And pre-season can’t really be used to gauge the form of a team for the upcoming season anyway – see Tottenham’s campaign last summer. Plus, there’s still time for the Gunners to add to their squad. However, IF one team were to drop out of the top 4 next season, that team would have to be Arsenal. I think that the loss of Adebayor to City is worrying for a few reasons. First and foremost, (no matter how much you hate him) remember that he’s scored over 40 goals the past two seasons. This isn’t a record that should be brushed aside. He also gave Arsenal something different in attack, in that he’s tall, strong, athletic and quick. He added real presence to an Arsenal side, something not many in the squad could do. His mere size and ability to hold the ball up at the other end of the pitch, forced defenders onto him, much like a top-tier wide-receiver in American Football. This freed up space for his teammates in attack, and allowed them the time and space to express themselves in that ‘Arsenal’ manner. Thierry Henry attests to that luxury here. I feel that without Ade in the side (and without a similar replacement), Arsene will have to change their approach to some games, which may take some getting used to. Finally, they’ve sold their star striker to a league rival looking to overtake them this season. A striker who now has a point to prove. This could be dangerous. Many have bid Ade ‘Good Riddance’ as his flirtation with AC Milan, general lack of interest and ability to stray offside brought most fans to the brink. That’s fine and I can see why people feel that way. However, the gap he leaves both in goals scored and size could really come back to haunt the Gunners. I’m not an Arsenal fan, so I don’t have faith in Eduardo, RVP and Bendtner to step in and efficiently do the job. First of all, I doubt the first two will get through the season injury-free, Eduardo’s still coming back from his horror injury and Bendtner just hasn’t proven himself yet. Not to mention that Adebayor won’t be holding up the ball or attracting defenders anymore. Most fans have come around to this, as the calls for Arsene to spend have been louder and more desperate than ever. But will he? Another area of concern for me (If I was an Arsenal fan), would be the midfield. Samir Nasri broke his leg in training yesterday and will be out for three months. He was an integral part of the team last season and impressed a lot of people. His loss coincides with Rosicky’s return, which some may feel will lessen the blow. However, Rosicky hasn’t played a competitive match in 18 months and after such a lengthly layoff, he’ll need time to get back into the groove. How a team starts can often set the tone for the rest of the season (will a team be playing catch-up or not?) and these injuries do not bode well for the start of the upcoming campaign. The basis of another excuse-ridden season, perhaps? Hopefully not – we’re all sick of excuses by now. Arsenal fans need only recall the ease in which United dominated the midfield over 180 minutes in the Champion’s League. Yes, they might have taken 4 points off them in the league, but that’s not the point. The point is, as the season wears on and the important games pile up, the young gunners simply do not have the mettle to deal with it. This has been proven time and time again, but the club have failed to address this problem. The talent and potential in the Arsenal midfield is unquestionable, but it’s been clear they need some help. Are Arsenal fans ready to wait another long year for their players to ‘find their feet’ or gain ‘maturity’? If I was an Arsenal fan, this is the general point of view I’d hold. I’d want Mr. Wenger to go spend some money. Some real money on some ‘real players’. He doesn’t need to go out and get a £30 million-plus superstar – he should look into some proven, experienced players with leadership qualities that would benefit the young team. I think it’s important to note that the fans haven’t lost faith in him, it’s just that the money should be there to spend and there are clear areas that need reinforcing. It’s about time, don’t you think? But wait, the transfer window is still open so isn’t there a chance Arsene will go out and spend? Not, if you are to believe what he says. Apparently, he believes the current squad is strong enough and there is no need to replace Adebayor or shore up the midfield. He could just be trying to fool us in an attempt to do business without the glare of the media, but other bloggers (including le-grove) aren’t so sure. This entry was posted on Tuesday, July 21st, 2009 at 5:30 pm and is filed under Footy. You can follow any responses to this entry through the RSS 2.0 feed. You can leave a response, or trackback from your own site. 1. Right now Man City has no defense. Tal Ben-Haim barely played this season, couldn’t make it for a top four team that had injury problems in the back the year before that, and in 06/07 started for a defense that let up more goals than the team scored. And the attack included Nicolas anelka, el hadji diouf, nicky hunt, ivan campo and Kevin Nolan. Pablo Zabaleta may be an Argentine international, but he hasn’t been called up for WCQ on a team that isn’t known for its defense. You don’t hear his name thrown out when talking about best backs in the premiership either. Micah Richards although an “England international” and still very young, hasn’t been outstanding for City or the U-21s England side. As the European Under-21 championship final exposed, England’s defense wasn’t exactly jaw dropping. Nedum Onuoha hasn’t impressed me or really proven he can be a starting back for a top 4 team, let alone a mid-table team though he is young and Everton is causing a stir by putting in a bid for him. Richard Dunne is alright but the main point remains, he’s only played in 10 UEFA cup games ever and has never played for a team that was actually chasing hardware. He’s also not getting any younger and with the last six seasons him having played around 266 games, injuries may just get the better of him one of these days. Wayne bridge hasn’t played more than 19 (half) of a premiership season since 2003-4. He is also the highest paid full back in the world and he was Chelsea’s second choice at left. This group of defenders let up 32 away goals last year, more than relegated Newcastle. Barring the highly unlikely signings of BOTH John Terry and Joleon Lescott, the poor defensive situation at Man City will not change. Mr. Chelsea is going nowhere and David Moyes would rather shoot himself in the foot than sell Lescott. After three straight years of fifth place, Everton are not looking to go down. 2. Mark Hughes is not THAT good of a manager. How many stars has Hughes managed? Benni McCarthy, David Bentley and Roque Santa Cruz are far from being stars, they are more like chip-on-their-shoulder players who didn’t fulfill their potential and Hughes gave them their second or third chance and lots of minutes for a mid-table at best team with no pressure for results. He now has a lot of pressure and a handful of volatile “stars” (Wright-Phillips, Robinho, Tevez, Adebayor for starters). Having played for Manchester United, managed Wales (which is not a high pressure job, nor do their results matter to anyone; rugby loving Welsch included) and Blackburn doesn’t mean anything. In four years of management in the premiership he has only earned a spot in the UEFA cup once. This weak managing pedigree doesn’t bode well when one considers who he will be up against. The likes of Ferguson, Ancellotti, Benitez, Wenger, the ever crafty Moyes and O’neil, and even Redknapp (with his FA cup trophy) are nothing to scoff at. An easy example to point to is Elano. He wants to leave, giving credence to the argument Hughes is incapable of managing superstar players. If a team has a starter for Brazil and isn’t starting them on the club level, it doesn’t mean the team is that good at midfield. Furthermore the aura surrounding former Manchester United is ridiculous. Steve Bruce has had his bouts with mid-table premiership and relegation into the championship, managing clubs Birmingham City and Wigan to nothing special and will continue to do the same at the Stadium of Light. Paul Ince failed on the highest stage, almost relegating a club Hughes left in shambles. Roy Keane, although I am a fan, quit Sunderland after barely staying up in the premiership in the first year and being close to the drop midway through the second. With this evidence, there is no argument that playing for Man U indicates a successful managerial career. 3. Mid-table to bottom table teams will no longer be playing Manchester City for the win, they will be playing for the tie as they see them as a top 5 team now. This past season City only had 5 ties compared to Liverpool’s 11 and Arsenal’s 12. Although they have a good strike force, if the game plan against City revolves around putting ten men back there will be less opportunities to score; making opponents like Hull City not a guaranteed 3 points. 4. The Manchester City Strikers are volatile and could easily cause tension in the locker room. With Adebayor, Bellamy, Caicedo, Robinho, Benjani, Santa Cruz and Tevez you have six quality strikers that all want to play as much as possible. There is no way that Mark Hughes will be playing with 6 strikers in his starting XI. Somebody is going to want out or be angry about not being given enough chances which can easily cause serious rifts in the locker room and bad press. Even if tension is somehow avoided, Bellamy is injury prone as is Santa Cruz who is just coming off of surgery and who has in 7 of the past 8 seasons only scored more than 8 goals once. Strikers that always have to worry about their job also tend to be more selfish and less likely to be making the assist pass instead of taking a bad shot. Robbie Keane, Jermain Defoe and Berbatov didn’t displace Arsenal and they had England’s no.1 not Ireland’s. 5. There have been significant player losses or no significant additions to the other three of the top four. For Man Utd, Ronaldo (18 premiership goals) and Tevez (5 premiership goals) are gone, taking with them 23 of Man Utd’s 68 premiership goals. Adebayor only scored 10 of Arsenal’s 68 premiership goals. Valencia and Owen bring 11 premiership goals between them but Owen is an injury risk eating his morning Wheaties(as is Owen Hargreaves) and neither will draw defenders like Ronaldo, who allowed other players much more space and time to execute and beat opponents while the defense worried about him. Giggs and Scholes certainly aren’t getting any younger. Berbatov and Macheda can be inconsistent. Although Rooney is great, how will he hold up when the defense focuses on him. That said I do not really see them dropping out of the top four, I am just saying they are much more vulnerable than the past three years. Yet ANOTHER coach at Chelsea makes the job pressure enormous. Win now or go the way of the many before you. The locker room is potentially a little bit on edge because Terry’s not straight out saying he is staying. Ballack, Terry, Lampard, and Drogba aren’t getting any younger. Deco and Carvalho want out, which could cause a locker room situation. The additions of Zhirkov and Sturridge nicely complement the already existent chemistry and quality of players but they won’t necessarily play that much or make a difference. Though they have not lost anybody (yet), they have not added anyone that will dramatically improve a squad that finished third in the league, failed again in the Champions League, and were lucky Almunia was not in net in the FA Cup semifinal. Liverpool has only brought in Glen Johnson, an attacking defender who even with David James behind him, was part of a backline that allowed 57 goals (6th most in the premiership). Mascherano and Alonso want out bad (to Barca and Real respectively). They couldn’t even get Gareth Barry to come there after two years of pursuing and champions league football on offer. I think there season this year was a little bit fluky as well. I think they are more likely to drop out of the top 4 than Arsenal are but I think no one is going anywhere in the top 4 this year. Arsenal took four points from Man Utd, three points from Chelsea, drew twice with Liverpool. It is clearly not that the other top 4 teams are better than Arsenal, it is that Arsenal had trouble putting away easy games the past two years (something indicative of a young team). You might not “have faith” in the young gunners, but now that they have had two or three years of being in contention for the carling cup, FA cup, champions league and the premiership, the experience is there and the passion for more is too; making those slip-ups less likely. 6. Hleb, Flamini, Gilberto, Edu, Henry, Bergkamp, and Veira, all left in the past four years and Arsenal has still finished in the top 4 and found a way to replace their goals and positions with their youth movement. Fabregas emerged because of midfield vacancies. 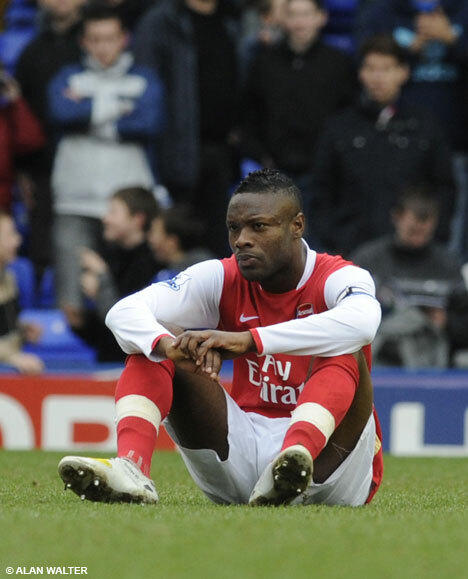 Adebayor had played less than Bendtner for Arsenal and scored less than Bendtner before being given Thierry Henry’s cleats to fill and he scored thirty goals. How can you not “believe in Bendtner”? He scored 14 goals this year, including 9 in the league. Even AC Milan is rumored to have put in a bid exceeding 10 million pounds for him. 7. Arsenal’s team chemistry. There have been very few face changes at the Emirates the past couple of summers which although seemingly more important for children’s hockey in a movie like the Mighty Ducks, I think it is more valuable than is usually noted. There is less lockerroom bickering and more focus on the same goal of winning hardware. In effect, this young team has “grown up” together. They had a 21 game unbeaten streak in the league, much of that without their best player, Cesc Fabregas. To their credit they made it to the semi finals of both the Champions League and the FA Cup and still finished in fourth well clear of fifth place. 8. Who Arsenal does have at striker. You mentioned Robin Van Persie, Bendtner and Eduardo but failed to mention Carlos Vela, Theo Walcott and Andrei Arshavin. Unlike City’s strikers, the latter two also play well on the wings or up in the center of the midfield. Vela, although only 20, has had a year to adjust to the English game, appearing 29 times (including 8 champions league games) and scoring 6 goals. Walcott had his trouble with injuries but still managed three goals for England in four WCQ matches and 5 goals for Arsenal this past season. I see no reason that with Adebayor and the sometimes long ball tendencies Arsenal used when Ade got lazy gone, Walcott doesn’t take advantage of the space and his pace. Arshavin is phenomenal and the fact he wasn’t mentioned in your article is a shame. He singlehandedly almost beat Liverpool earlier this year. His 6 goals in 12 league games while he was still getting a feel for the English game are sensational. With a full season at the Emirates I think the sky is the limit on what he can do in both the league and the Champions League. Additionally, if RVP were to stay healthy for a whole season it would not be surprising to see him score at least 10 if not 20 goals. Eduardo is more injury prone but anytime he is healthy he is still a talent. In two starts this year he scored three times. 9. The defense has more depth this year. With the addition of Thomas Vermaelen, Arsenal now has 8 startable defenders (Toure, Gallas, Sagna, Clichy, Senderos, Djourou, Silvestre) along with the young Kieran Gibbs and the defensive midfielders Song and Eboue to fill in should another injury problem occur at the back. The back as of late has seemed to be the Achilles heel and it now seems to be more shored up for the high amount of games a team in contention for the league, FA cup, Champions League and Carling Cup. 10. Arsenal doesn’t play a top 3 team after February 9. They play Man City at home in April. Scheduling is very important as the last two seasons have shown that Arsenal’s hard end of year schedules breaks them down right at the end. With this easy domestic schedule it could also mean a deeper run in the Champions League and no break down. That said, with no Europa League for Man City, they will be focused solely on the Premiership and FA Cup which is not mentioned in your article but something that actually is worrying. It would be advantageous for Arsenal to have one more holding midfielder like an Inler (the Swiss international rumored to be on Wenger’s radar) but it’s not a make or break purchase that will knock Arsenal out of the top 4 should they not do it. Nasri is rumored to be back in six weeks and until then Aaron Ramsey will show many “non-believers” that Wenger is a transfer market genius. Good bye Adebayor, if you are not successful, Arsenal will thank you for the 25 million pounds you brought in. If Ade is successful, rest assured that Arsenal has a sell-on percentage and a percentage kicker should Man City a. knock them out the top 4, b. win a cup and c. if Ade scores a certain amount of goals. wow…thanks for your comment. i agree with most of your points -although they are all valid in some way or form. however, i still think arsenal will struggle (not necessarily dropping out of the top 4) – not being an arsenal fan, i just don’t have the faith that their young guns will step up. I also feel that IF i was a fan, id be worried/frustrated with wenger’s transfer policies. not only selling a star striker to a now direct rival (perhaps one could argue tevez..) but not making any direct improvements to the parts of the squad that everyone (but wenger) thinks needs improving. but only time will tell. it will definitely be another interesting season. it depends on if wenger brings in someone to replace adebayor, he has some cash from the sale so theres no excuse anymore. another thing is they need to fix that problem in defence, kinda weird that toure and gallas hates each other but they play together.